This is the transcript of a podcast interview conducted by André Tomlin @Mental_Elf with Therese Kristine Dalsbø and Marita Sporstol Fønhus, two Norwegian Cochrane review authors, who talk about their recent systematic review, “Patient-mediated interventions to improve professional practice”. Recorded at #CochraneForAll, the Cochrane Colloquium, 2018. Right. Hello everyone. This is Andre and welcome back to the #CochraneForAll podcast. I’m here with two Cochrane systematic reviewers. It’s great to get a couple of reviewers on the podcasts, so thanks a lot for joining us. It’s Marita and Therese. Do you want to introduce yourselves, please? …Marita Fønhus and I also work at the Norwegian Institute of Public Health and EPOC (Effective Practice and Organisation of Care) and Cochrane Norway. And you’ve just published a new systematic review on “Patient-mediated interventions to improve professional practice”. So, this is very much a review that plays to the theme of this conference that we’re at here. And for me, it’s a review that kind of makes intuitive sense. So, I have a few health conditions myself and I’ve been along to the doctor and I’ve worked in evidence-based health care for twenty years, so when I go to my doctor and ask about things, I tend to go along with a meta-analysis or two, and when I present that evidence to my doctor, I often get a very, “ooh what’s this?” kind of response and they suddenly wake up and become much more attentive. So, it makes sense to me that if you go along with information, or evidence, or some kind of piece of evidence that actually demonstrates you are an engaged patient and you know what you’re talking about, that that will have an impact on clinical practice, clinical behaviour. “Patient-mediated interventions”, that’s not necessarily a phrase everyone will understand. Tell us what that covers; what kind of interventions you’re looking at here. We have used a definition that is any intervention aimed at changing the performance of healthcare professionals, through interaction with patients, or information provided by, or to patients. So, it’s very wide. So, it’s things like giving information to patients so that when they go to meet with their clinician, they have a different experience than they would have, if they just turned up? Or educating them in such a way that they can engage in shared decision making? Or, I guess, getting involved in the actual organization that they’re working within? Yes, yes. And being part of a committee or board at the hospital. Or they can actually educate, as you say, personnel, staff or GPs on how to make clinical explanations, how to approach patients, etc. And you also have this one category that we have named, “information from patients about their own health concerns or needs”, which is one category where, for instance, before a clinical encounter you’ re sitting in the waiting room, and you’re filling out a form about your own health, where they may assess risk factors or see if you are above a threshold for a mental condition. So, it sounds like a really tricky review to do, because you’ve got such a wide potential pool of reviews… of research to draw on and there’s lots of potential for false positives, that you would need to exclude. What did you find? How many studies did you find? And what were they about? We should say that it’s updated to March 2018, so it’s quite a recent search. And up to then we found and included 25 randomized controlled trials; quite a few of them were cluster randomized. And within those 25 studies, six were the one we categorised as “patients giving information about themselves” and we had 13 in a category of “patient information”, like patients receiving reminders or simple one sheet information about best treatments. And then we had five that fell into the category of “patient education”, and then we had one on “decision aids”. But there were some difficulties trying to categorize “information” and “education” because there is not a clean cut line between those two. So, they were based on our interpretation of the different definitions and the way it was described in the studies. What were the findings? Where is the strongest evidence here? Well, the strongest evidence is for the interventions, where patients give information about their own health concern or needs, for which we have moderate-certainty in the findings, and we also have moderate-certainty about patient education interventions. Very positive. And also about patient information, but these results, or the findings, were low quality or low certainty. So, just to kind of paraphrase that in layman’s terms, if you’re talking about educating patients, so we’re saying that there is some certainty in the evidence that by educating patients that will improve clinical practice. So that’s a really kind of intuitive thing. And moderate is quite good, actually. It’s only…it’s not high but it’s moderate. So, I would say, it’s very solid. And in terms of the patient information being given to clinicians, can you give us an example of the sort of thing that people would…What kind of information is being captured and how is that used by the clinician? Well, for instance, if there’s a focus on mental health and you wanna detect, to manage and treat or maybe refer cases, where it’s needed, then you have this, for instance, questionnaire in the waiting area which patients can fill out while they wait for the clinical consultation, and then this meeting can then be also set by what is captured in this questionnaire. Maybe that person wasn’t there to talk about their mental health but it really is the issue for the person, so this might set the clinical agenda differently than it would without this kind of information getting retrieved from the patient. OK, that sounds really interesting. So you’re talking there about having diagnostic checklists for things like depression and anxiety, just as a general thing you give to everyone in a cluster trial, and that information is given on to the general practitioner. Yes. Or you can have a form filled out by a carer, for instance, a parent with a child with asthma. And you can also have different types of risk assessments, if you are at risk for developing diabetes or other chronic conditions – this would fall in with this category. What is your sense? Is it the fact that the clinician’s thinking about that thing? Depression, for example, doesn’t get picked up a lot of the time in the primary care setting, as people present with all sorts of other physical complaints or tiredness or whatever. Is your sense that it’s actually the act of giving to the general practitioner a piece of information that says look, talk about depression, or do you think it’s actually the content of the information, that’s making the difference? I think the point here is, that it’s more the awareness of, more than just asking about depression, but more like asking how the person…what is going on in the life of the person, rather than, “Are you depressed?”, so to speak, so that if you have multiple questions that can tap into, for example, mood, that would be something that the patient and the physician can talk about together, in their meeting afterwards. Yes, I guess as primary care in this country, I’m sure it’s the same in Norway, is extremely pressurized, and patients only have three or four minutes with their GP, and if you go in asking for antibiotics because you’ve got flu, then you’re not necessarily going to speak about mental wellbeing as part of that. Yes, so it’s probably not on the agenda. Right. Interesting. So what is the kind of take away message, do you think, from this review? In terms of practice? In terms of other research? Well, the main finding is that patients can contribute to increase how the doctors adhere to guidelines. That’s the main take home message, I would say. And I think that…Well, you mentioned that we found evidence for some interventions, but there are also some interventions we didn’t find data on. 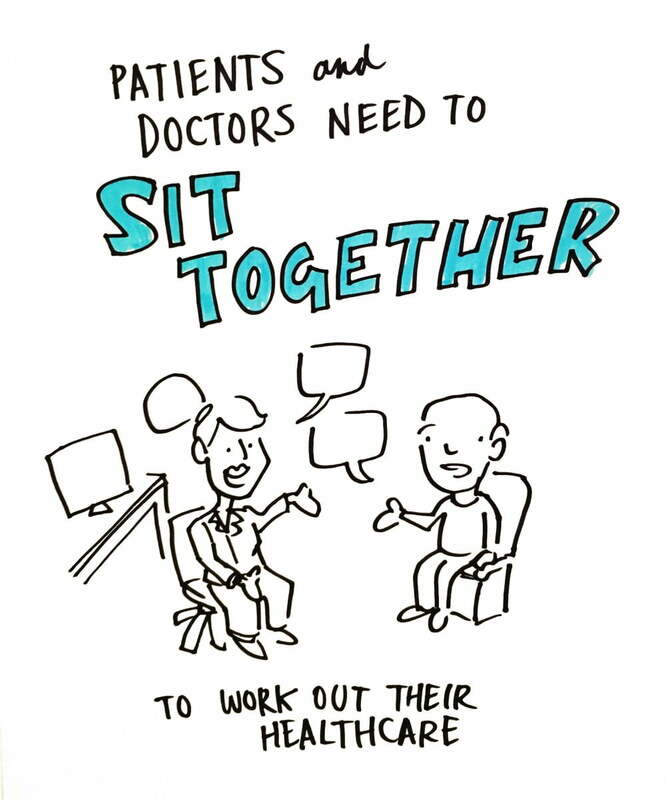 And also, an example of those are where patients are part of a committee or a board in a hospital or even at a higher level where patients are a part of the education of healthcare professionals. But also, another thing that was quite challenging in this process, was this terminology and the definitions used in this field, because there are so many disciplines and professionals that work within this field. So it’s kind of hard to make a systematic approach. And also the comparisons and what is usual care and standard care, and we would love it if we, in future studies, can really describe in detail both the interventions but also the comparisons so that we know what we are really pooling together. I’m really interested in the point about there not being any randomized evidence that getting patients involved at board level in a health organization is a good thing. Because that’s something that happens right across the board, we’re doing that already. And it kind of plays to Jennifer Johannesen’s keynote, I think, later on in the conference, where she’s talking about patient engagement and are we doing it because we know that it actually works or are we just doing it because we feel that we should be involving people and co-producing? What is your sense?…What is your feeling about that, if we don’t have any randomized evidence? Would it be randomized evidence that we would be looking for, do you think? Or would other sorts of research be more appropriate? It might be that the focus has been on process outcomes and patient health outcomes but not necessarily regarding those that are actually doing the job, which are the healthcare professionals. So this is just a shift in focus, I guess, and that we should maybe think more about in the future. So I guess there are probably lots of studies that show that this is sensible and it’s good effective health for patient involvement, in all of these kinds of areas but they just haven’t looked at the specific focus on professional practice, I guess. And we should also say that we only searched for randomized controlled trials so there could be, for example, very high-quality interrupted time series that say something about involving patients in boards. Also, we didn’t search for studies on, for example, types of interventions delivered to health students, I mean, such as doctors training to be…sorry students training to be a doctor or someone training to be a nurse, that could also be several interventions, where we don’t have…where we didn’t tap into it. Yes, I guess there’s lots of qualitative evidence as well about working together and co-producing and maybe that is quite often the kind of thing you would look for to answer some of those types of questions. Another thing, we had a lot of outcomes that we thought were interesting to find an answer for and, of course, besides patient health outcomes, we also wanted to see if there were any effects that we should be concerned about, on dealing with interactions between the patient and the doctor – how satisfied they were – the acceptance and so on. We didn’t find anything about those important outcomes. This communication and trust relationship and how this works. We don’t know enough yet, so we are really hoping a lot of new studies will look into this. And it would also be interesting to see some qualitative reviews on this as to how the patients, for example, feel about having a form to fill in before the consultation and also if the doctors find it worthwhile. Do they like it? Do they use it? Do they find it more complicating? They would also be interesting questions. And also more about the health economics here and also equity, and there are a lot of issues here that haven’t been covered, because we didn’t find anything. That’s really interesting work. Thanks a lot for joining me and talking about it. I hope you enjoy the rest of the conference.